In the constant stream of images of refugees making their way to Europe and the USA, we often tend to forget the stories behind the faces of the people we see on camera and newspaper articles. Since many young families, or the young fathers alone, start the sheer never-ending journey from Africa or Arab countries, their stories speak not only of the possibility of a future they want to create, but also the family they have left behind. Films such as Ai Weiwei’s documentary “Human Flow” or Philippe van Leeuw’s “Insyriated” are only two examples of artists who have decided to focus on these stories, these families and their conflicts, one which is after all ours as well. 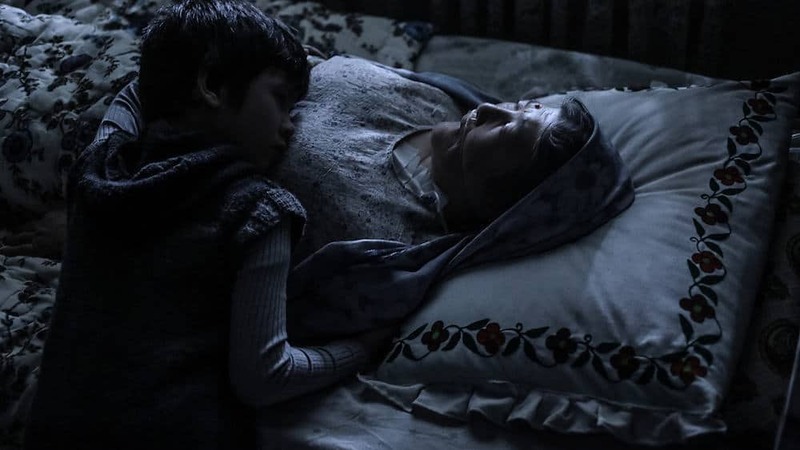 In his second feature “Rona, Azim’s Mother” Afghan director Jamshid Mahmoudi tells one of these stories. Similar to his former feature “A Few Cubic Meters of Love” (2014), it is a film about a family torn apart between fleeing the country and staying while trying to overcome seemingly insurmountable odds. Mahmoudi, whose feature is produced by his brother Navid, may draw from experience as his family also had to escape their home country Afghanistan and re-settle in Iran. It is both a joyous as well as a sad occasion for Azim (Mohsen Tanabandeh) and the rest of his family. While his brother Faroogh (Mojtaba Pirzadeh), his wife and their sons have come up with the necessary money to make their way to Germany with the help of smugglers, their last family celebration also means it may be one of the last times all of them are together. Especially Rona (Fatemeh Hosseini), Azim’s and Faroogh’s mother, is sad to leave one son behind and stays mostly silent throughout this last celebration. However, before his brother leaves, Azim has been told Faroogh has decided not to take their mother with them. Infuriated, he takes Rona into his home and swears he will never speak to Faroogh or his family again. To make matters worse, a discovery about his mother’s health forces him to make one of the toughest decision of his life which puts his own loyalty as a son to the test. Considering the premise of Mahmoudi’s film, you might expect the result to play like one notions of sentimentality or melodrama. Even though glimpses of these are here and there, they always stem from the strong family bond the director’s script has established early on, thus making them believable and authentic. To be specific, themes such as politics and war may be construct the background to the conflicts portrayed in the film, but Mahmoudi’s core interest is more with the family drama, the conflict between the two brothers and how it influences the family as a whole. This approach may set the story in this specific cultural context, but the issues Mahmoudi’s script and his characters deal with are universal, which is possibly one of the many aspects that made the film Afghanistan’s submission for the 91st Academy Awards. Essentially there are two main aspects which stand out in this quite interesting movie. First of all, Mahmoudi and his cinematographer Koohyar Kalari have chosen an understated, yet character-centered approach for their story. Especially the scenes taking place, for example, during the family celebration at the beginning or the dinner of Rona, Azim and his wife are beautifully shot reminiscent of similar scenes in the works of Yasujiro Ozu or Asghar Farhadi. Although the surface may look different, the audience senses the dichotomy of each character; the way they are privately and within the family unit. Ultimately, this is established most significantly because of the cast Mahmoudi has assembled here. Mohsen Tanabandeh and Mojtaba Pirzadeh as the two brothers portray men torn between the loyalty as sons, towards their own families and their own principles dictated by their culture. In the role of their mother, Fatemeh Hosseini represents a type of woman respected by the family, but also a character who has chosen to stay silent most of the time. However, it is precisely this kind of silence which torments especially Azim, a man whose stoic insistence on the moral authority within their family is proven repeatedly. “Rona, Azim’s Mother” is a film about family, loyalty and the power of showing mercy and forgiveness. Without being sentimental, Mahmoudi has created a quite touching, highly emotional film whose understated approach will likely win him many viewers. In the end, it also proves the kind of talent Mahmoudi is and what he can do within the medium of film.